192 (PVH 992) was an AEC Regent V 2D2RA with East Lancs. 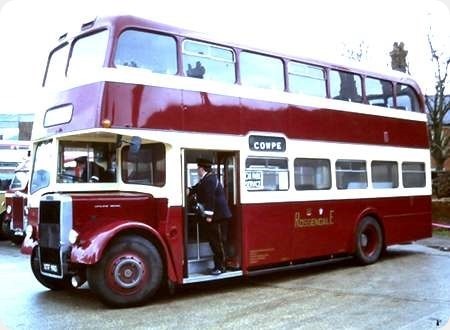 H37/28R bodywork, one of a pair (192/3) added to the Huddersfield Joint Omnibus Committee fleet on 1st February 1960. They had the AV590 engine and Monocontrol semi-automatic gearboxes. The traditional exposed radiator arrangement had remained an option for the Mk. V and the JOC had taken eight Roe-bodied examples (182-189) a couple of years previously, but this pair must have been amongst the last examples before the option was withdrawn. With their sturdy and well finished East Lancs bodies they were in my opinion the most handsome of buses, so typical of the Huddersfield fleet in that period – oozing real quality. 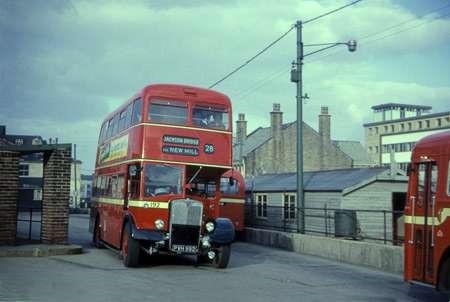 The Corporation/JOC system at Huddersfield had worked in a different way to the one at neighbouring Halifax, not being based on whether the services operated outside the borough or not, but on what type of vehicles were used. Tram and then trolleybus routes had all been run by the Corporation whilst all motorbuses were the responsibility of the JOC. 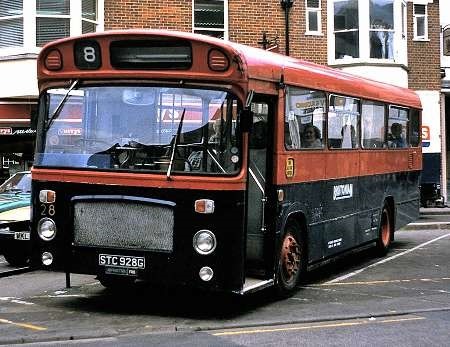 However when trolleybus abandonment in favour of motorbuses began in the early 1960’s the old arrangement would have eventually meant the JOC would have operated all the routes so a new agreement was reached such that former trolleybus routes would remain in Corporation hands and a separate fleet of buses was gradually built up carrying a more streamlined trolleybus-like livery and numbered from 101 upwards. From the 1st October 1969 the Corporation took over the former railway company’s share of the JOC (by then owned by the NBC) as well as the local stage service of Hanson’s Buses, and from then until the formation of the West Yorkshire PTE in April 1974 all services were Corporation operated. 192 and 193 passed into the PTE fleet as 4192/4193 and were withdrawn shortly afterwards and scrapped. 193 is seen here in Huddersfield’s Manchester Street Bus Station in the latter all-Corporation days having just been treated to a magnificent repaint. The exposed radiator AEC Regent V seemed to be very much a Yorkshire thing. In addition to the Huddersfield examples, Leeds, Doncaster and East Yorkshire also had them. The only non-Yorkshire examples I can recall were some for City of Oxford and Rhonda. As we’re talking Yorkshire here where the natives have a reputation for thrift, could it have been that the exposed radiator version was cheaper! But in Sheffield we had 86 Regent III with Regent V fronts! Thrift, nowt wrong wi that lad, after all, it is easy for anyone to identify a Yorkshire man abroad; he is the one at the till saying loudly "How Much"? However, the real reason for the exposed radiators is some Yorkshireman appreciate beauty more than tin fronts (the manager in Bradford who bought hundreds of tin fronted Regents, was not, after all, a native thee knows). I suspect that it was more an accessibility issue. I can remember in my far off preservation days what an awkward and painful experience it was just trying to remove and refit the lift-pump on my AEC Renown, standing precariously on a step ladder slumped over the wing with the bonnet edge trying to crush my ribcage as I reached down into its innards. With the exposed radiator you just lifted the bonnet and there it all was, and if the job was a bit bigger you just unbolted the wing, lifted it off and you could get right in there and reach everything with ease. Nottingham City Transport had a little matter of 65 exposed radiator Regent Vs – nos. 209-273 (UTV 209-238 and XTO 239-273). Park Royal 62 seat bodies. Delivered 1955-56. Huddersfield also had two Guy Arab IV with exposed radiators, and nearby County Motors had four. 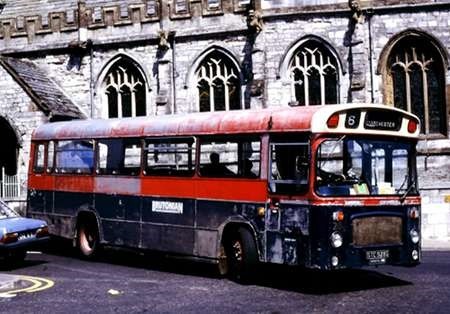 A small correction to the caption – motorbus deliveries to the Corporation fleet were numbered 401 up, 101 being reserved (at that time) for JOC double-deckers. Don’t forget the elegant Guy Arabs of Exeter Corporation which took delivery of 20, all with exposed radiator, between 1956 and 1960.Five had Park Royal bodies, five had MCW, but the best looking were the Massey-bodied ones – the first five and the last five. Fotunately number 50, TFJ 808, the first of the Masseys, survives in superb condition. It was chosen for preservation by Colin Shears as it was ‘the most musical’! An exposed-radiator Mk.5 that is easy to overlook is the most individual one of all, Longwell Green bodied PWO783, number 9 in the fleet of Bedwas & Machen UDC. Of the fleets that have been mentioned, only Doncaster and Nottingham failed to go on to buy concealed-radiator equivalents. True, David: Doncaster returned to Daimler in the 60’s and had to buy concealed radiator CVG6’s but amongst its last half-cabs were some exposed radiator PD3s around 1963. I used to wonder if exposed radiators were seen as more macho in the Council Chamber- like Atkinson coal lorries or even Peterbilts. There was not a lot else Macho about a PD3 and Doncaster transport seemed to be about eking out, so cost was probably the answer: although making an exposed radiator look respectable cannot have been so cheap compared to a glass fibre moulding. As John Stringer says the exposed radiator arrangement made it much easier to access the engine and its ancillaries than with a tin (fibreglass or aluminium) front. Also the view of the nearside kerb from the driver’s seat was better. The big snag was, I suspect, the exposed radiator was deemed old fashioned in the eyes of the fashion police of the time. Plus the fact accident damage was probably easier to repair on a "tin" front with the use of plastic filler. In Manchester the issues were certainly engine accessibility and driver sightlines, to the extent that, when Daimler refused to supply chassis with exposed radiators, Manchester worked with them to redesign the alternative. XTF 98D is a Leyland Titan PD3/4 with East Lancs H73F body, new to Haslingden Corporation in September 1966. Two years later, Haslingden and Rawtenstall combined their fleets to form Rossendale Transport, in which guise we see it here. It is taking part in the King Alfred running day in Winchester on 1 January 2006. It is behind the Bus Station. Here is a closer shot of the fleetname. Think the vehicle is now in Oxford area working for an operator. Thanks, Roger. I think that, when I took the photos, she was with Quantock. 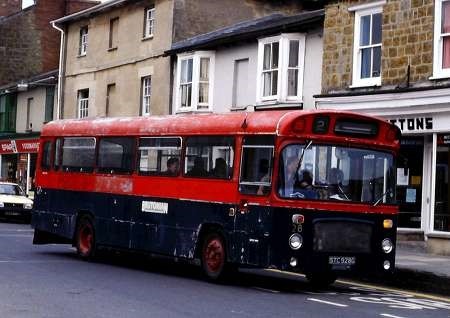 XTF 98D was last known with The School Bus Company (Oxford) Ltd of Kingston Bagpuize. Kingston Bagpuize … now how is THAT pronounced? The "Kingston Bag-" part is (I hope!) straightforward, but after that? When I first saw it (on a map or a road sign), I had an attack of franglais and rhymed it with squeeze, but I think I’ve heard it rhymed with views. It would, of course, be delightful if the word is actually pronounced like … a certain saggy old cloth cat? Graham, according to Wikipedia (not always reliable) the pronunciation of (Kingston) Bagpuize is "bag-pews" – but I didn’t know either until your question prompted me to look it up just now! Graham: I live only 5 miles from Kingston Bagpuize, and although jokey versions such as "bagpipes" are sometimes heard, the current pronunciation is as you’ve heard it—to rhyme with "views". It seems that Ralph de Bachepuze came over from Bacquepuis (pronounced roughly "back-pwee") in Normandy to settle in north Berkshire, so your attack of franglais was quite in order. Southmoor, adjoining Kingston, is fortunate enough to have the half-hourly 66 Swindon-to-Oxford service, but other nearby villages—Appleton, Fifield, Hinton Waldrist, Longworth and so on—have recently lost their bus service altogether and are therefore playing their patriotic part (at least according to George Osborne’s strange logic) in reducing the "drain" on public finances which decent public transport is said to represent. Thanks, Stephen and Ian, and yes, Chris, that is the cat that I had in mind. I used to drive XTF 98D on weddings etc. for Nostalgia Travel (Oxford). A very fine looking vehicle. NT sorted some issues with its injectors and made it run well – but, unfortunately, they had to re-trim the downstairs seats with PVC to replace the worn blue leather covers. Also, they removed the Rossendale name from its sides. Compared to NT’s Gardner engined Bristol FLF, the Leyland Titan cab was much noisier. Its Leyland O.600 sounded well enough at idle but, crikey, what an ear-bending racket when accelerating up to its 38MPH maximum!